Although we flew through Johannesburg, South Africa, several times, we spent the night on only two stopovers, between Sun City and Victoria Falls, and Victoria Falls and Cairo. Because we had so little time in Jo'burg we did not get a chance to site see, or even leave the hotel grounds. 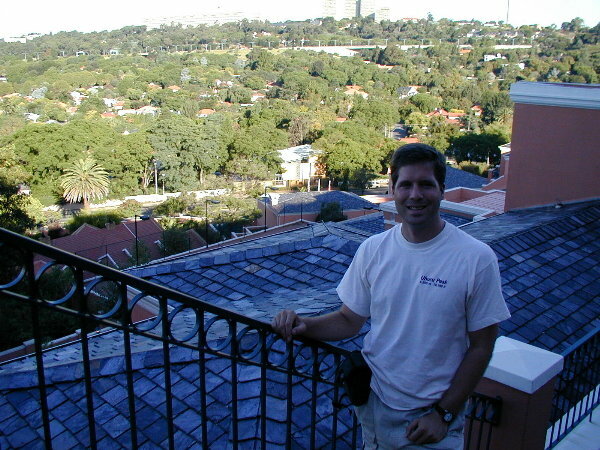 We stayed at the Westcliff hotel, a unique and very luxurious hotel in the Parktown suburbs. The hotel consists of many townhouse-like buildings on a ridge with panoramic views of the Jo'burg suburbs. We ate at the very nice restaurant (both times:) at the top of the ridge and enjoyed the beautiful night views from the deck overlooking the pool. 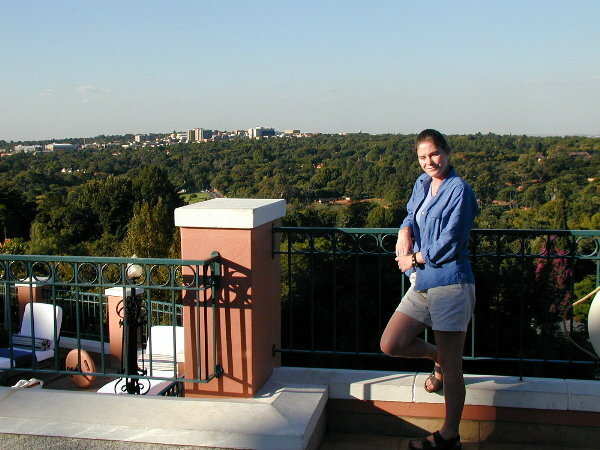 Kristen standing on the Westcliff Hotel pool deck, with panoramic views of Johannesburg suburbs. 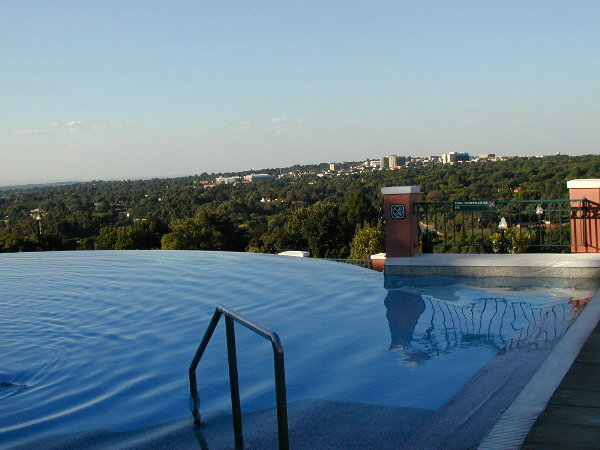 The pool at the Westcliff Hotel appears to roll off the edge of the ridge. Dan on the stairs at the Westcliff Hotel. The suite we stayed in was roomy with very large bathrooms complete with towel warmers. The coolest feature was the 'TV switch' on the wall that, when switched, raised the large TV out of table/cabinet at the bottom of the bed. We had told our travel agent in Cape Town that we wanted to stay in a hotel closer to town the second trip through, so that we could see more of the city, not just the suburbs. She called the Jo'burg tourism council for recommendations and they strongly suggested that we not stay anywhere in the city because of safety issues. Wow! We did note as we drove through neighborhoods to the hotel that absolutely every house had very high fences with razor sharp barbed wire. And, we stopped at a bank in an upscale mall and they had the most elaborate security system. There were multiple guards armed with machine guns standing outside a double set of reinforced doors with electronic locks and stop/go lights. A line of people stood at the outer door and waited for the outer door light to turn green and the door to unlock. One person would pass through the outer door, then wait in the area between the inner and outer door, until the outer door fully closed and locked, then the inner door light turned green and unlocked. Only after the inner door was closed and locked again would the outer door let another customer in. We assume a hidden security person had to unlock the outer door, as there were many security cameras and the number of people in the bank was limited. Getting out of the bank required the same process. We felt quite secure in that bank! On the first trip to Joburg from Sun City, it was a short domestic flight. We realized our good fortune of staying at the Westcliff when we were met by their transfer representative and taken to the black Mercedes Westcliff limousine. Neither of us are Mercedes fans, but the 25 minute ride was extremely smooth and comfortable. We did have to pay for the transfer but taken that type of transportation to/from the airport on every trip was very low stress. On the second trip to Joburg from Victoria Falls, Zimbabwe, we had to get through Zimbabwe's financially exploitive boarder process and take the sold-out flight. At that point we regretted not having upgraded to business class. Once again, the Westcliff picked us up at the airport and even took us on a couple errands before taking to the hotel. (+27 11) 646-2400 Very nice upscale hotel on a ridge, with great views of Joburg. Restaurant above pool is excellent.